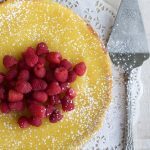 Lemon Cream Cheese Tart with Coconut Cookie Crust is the perfect treat for lemon dessert fanatics! The tart starts with a layer of cookie crust, creamy cheesecake filling and is topped with a fresh lemon curd. Inspired by Southern Living Magazines latest cover, Lemon Cream Cheese Tart with Coconut Cookie Crust is a lighter version of traditional cheesecake with a tart layer of homemade lemon curd. I love lemon desserts, especially in the spring and summer. I wanted to create a dessert that would satisfy my sweet tooth and be pretty enough to serve for a luncheon or dinner. Wouldn’t this be a perfect fit for Mother’s Day brunch? I made the Southern Living cover recipe according to instructions, but wanted the dessert to have a more crisp cookie-like crust, instead of a soft, lemon bar-style crust. I also really have a hard time eating a layer of cheesecake that’s really thick ( I know, I’m in the minority!) . The Southern Living recipe is a traditional cheesecake with 4-8oz packages of cream cheese included. Yikes. 2 lbs of cream cheese in one dessert?! I’m not usually a calorie counter, but I knew 2 pounds of cream cheese in one dessert was an over-the-top amount of calories per slice. I also knew I could cut the amount of cream cheese, still satisfy cheesecake fans, but also attract people (like me) who love creamy desserts, but don’t crave a thick slice of cheesecake! I love almost any type of dessert, especially one that resembles anything vintage, such as a good icebox lemon dessert. My brother in law, Scott, who is from Tennessee asked me if Lemon Cream Cheese Tart with Coconut Cookie Crust was a lemon icebox dessert! I’ve found some great vintage dessert recipes on FaveSouthernrecipes.com, where many of my own recipes have been featured. If you love a thick layer of cheesecake, the original recipe from Southern Living is the way to go. When I made their recipe, I followed the exact directions for the filling and curd layer. There were non stop ooooh’s and ahhhhhhh’s from my family, who sampled the dessert. They loved the thick creamy layer of cheesecake, with the lemon curd baked in. I was surprised at how much I loved the dessert. I think the lemon curd layer changed the dessert from a traditional cheesecake to more of a lemon dessert. The S.L. version baked part of the cooled lemon curd right into the cheesecake filling. It was a yummy lemony treat, but the lemon curd caused the cheesecake to be kind of soft, so it was difficult to get the cheesecake to hold its shape unless it was cut and served almost immediately from the fridge. I knew if I cut the cream cheese filling in half, it would change the dessert so it was more of a tart instead of a cheesecake, which again, is what I love. Reducing the ingredients in the cheesecake layer also meant less baking and cooling time, and overall less time making Lemon Cream Cheese Tart with Coconut Cookie Crust! I’m partial to the crust being slightly crunchy so it can contrast the creamy filling. One of my favorite pies when I’m craving chocolate and peanut butter is Sheri’s Southern Peanut Butter Pie with Fudge Topping , it also has a slightly crunchy crust with a creamy filling. I’ve made lemon curd several times and usually make it on the stovetop, but the microwave version is almost foolproof. It eliminates the need to stand at the stovetop and stir constantly, and also reduces the chance of burning the curd on the stovetop, which is a common issue when making fresh lemon curd. I love the addition of fresh lemon zest in the curd, which sets this dessert apart. Using a microplane grater makes all the difference when removing zest from fruit, I use mine for zesting citrus fruits and hard cheeses such as Parmesan and Asiago. If you don’t have dessert planned yet for Mother’s day, I promise your mom will love Lemon Cream Cheese Tart with Coconut Cookie Crust on her special day! Beat 4 tablespoons soft butter in a 2-3 quart microwave-safe bowl with 1 cup sugar until smooth. Add two eggs, beat until blended. Remove zest from lemon and juice the lemons. Add lemon juice and zest to butter mixture (mixture may look curdled) whisk all ingredients together. Microwave the mixture on high for one minute, stir with a whisk. Repeat 5 times for a total of 5 minutes, whisking after each minute. Remove from microwave and whisk again. If the mixture is not thick, continue to microwave at 30 second intervals, whisking after each until mixture is thick and smooth. This usually takes an additional minute. Scrape the curd in a clean, cool bowl. Top with a layer of saran wrap, pressing the wrap against the curd so it will prevent a film from forming. Place in refrigerator for one hour or until cooled. You may also prepare the curd using a stovetop by placing the mixture in a heavy pan and cooking over medium heat for about 12-15 minutes stirring constantly until thick and smooth. This may be done up to three days ahead of assembling the tart. Preheat oven to 375 and set the rack in the center of the oven. Crush the cookies in a food process or blender until smooth. Pulse together with melted butter, sugar and cinnamon. Press the mixture in a lightly greased 9-10 inch Springform pan on the bottom and up the sides about 1/2 inch. Place the pan on top of a cookie sheet and place in preheated oven. Bake at 375 for about 12 minutes. Remove to cool. The crust may be made up to a week before filling with cream cheese layer, or frozen for up to a month before filing and baking. Set oven temperature to 350 degrees to bake cream cheese layer. Beat the softened cream cheese, 3/4 cup sugar until smooth for about 2 minutes. Add 2 eggs and vanilla, beat for 1 additional minute. Spread mixture into baked cookie crust, and place tart back on cookie sheet. Bake for 25 minutes at 350 degrees. Remove from oven and let cool for about 10 minutes. Run knife around edges of springform pan, but do not release sides. Let tart cool for at least 30 minutes before topping with lemon curd. Spread cooled lemon curd on to tart and chill for at least 2 hours in fridge. When tart is set up, remove ring from around sides of pan. Place on serving dish, or on top of paper dollie. Top and serve with fresh berries, whipped cream and sprinkle with powdered sugar if desired. -You may use all fresh lemon juice, or juice the two lemons and then add additional bottled lemon juice to make 1/2 cup total. -Remove the zest before juicing the lemon for best results. 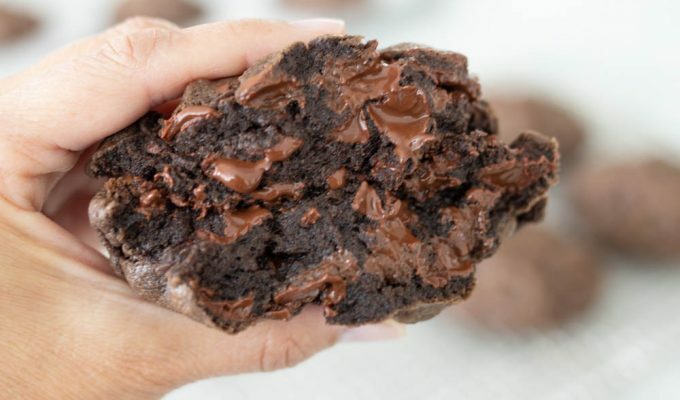 -Always bake the crust and the tart on a cookie sheet so the excess butter and sugars that bake off will end up on the pan instead of the bottom of your oven, causing a huge mess.-You may use any type of cookies to make the crust. I have used "Mrs. Thinster's" Coconut Cookies and Trader Joe's Toasted Coconut Cookie Thins. You may also use crushed graham crackers. -I remove the baked crust off of the cookie sheet and place it on a cooling rack. Also when the filled and baked tart is cooling, I place it on a cooling rack or on a clean cookie sheet to remove from the hot cookie sheet and allow the tart to cool quicker.- Don't be intimidated by the length of this recipe! You can make the curd and crust one day and let cool, and then make the cheesecake layer, fill and bake the crust the next day, top with cooled lemon curd and serve the same day. I have made this dessert all in one day, starting at about 4 pm and serving at 7. I use my fridge to cool the baked portions of the recipe to cool at a faster speed. I’m going to make the cream cheese filling part. I don’t know how many eggs to put in. It doesn’t say how many. Could you please let me know? 2 large eggs, its listed under the “filling” portion of the recipe. I made this for sunday dinner dessert and everybody loved it! I used the coconut thinsters and followed the recipe just like it is above! not a very strong coconut flavor, but a delicious bright lemon flavor. Overall delicious and i would make again! we needed more than 1 tart! Just made this with my new zester???????????? and my husband said it was the best dessert I ever made???? I made this for myself for my birthday. Delicious! My husband said it could be sold at Cheesecake Factory! 🙂 Thanks for such a fantastic recipe! I’m so glad this tart was a birthday success! Coconut and lemon are a winning combination. Happy Birthday from ABK! Can you be more specific about what brand cookies you prefer to use for the crust in this? Thanks! Any dry cookie will work. I used Mrs Thinster brand cookies from Trader Joe’s. They come in coconut or lemon flavor. Let me know how this dessert turns out for you. It’s a perfect spring dessert!